What do nine year old boys like? I have no idea. My co-worker’s kiddo, however, is really into video games and is having a big ol’ video game themed party this weekend. 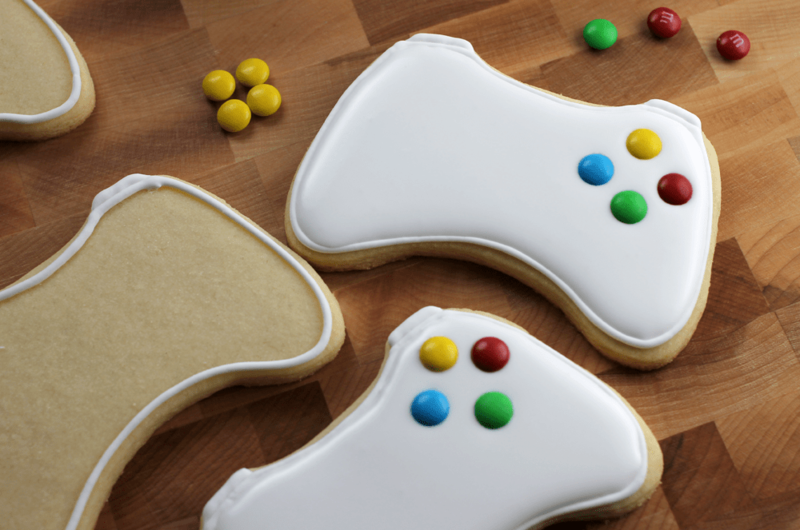 He’s particularly into his Xbox system, so Xbox controller cookies were quickly added to my project list. 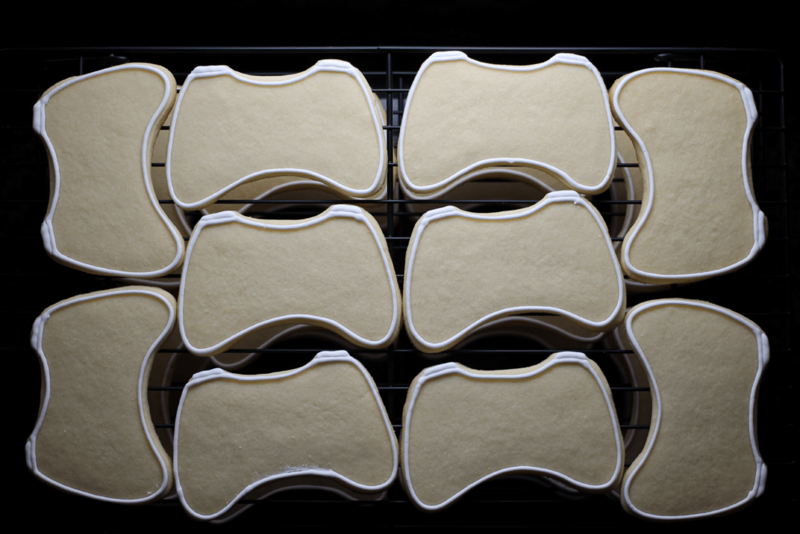 I had accepted the idea that I might have to cut each cookie shape into the dough by hand, but through some savvy internet searching my co-worker was able to find the perfect cookie cutter. It’s worth noting that I’m VERY glad I didn’t have to cut these by hand. The decorating took a surprisingly long time (I made three dozen), and cutting the cookies by hand might have killed me. 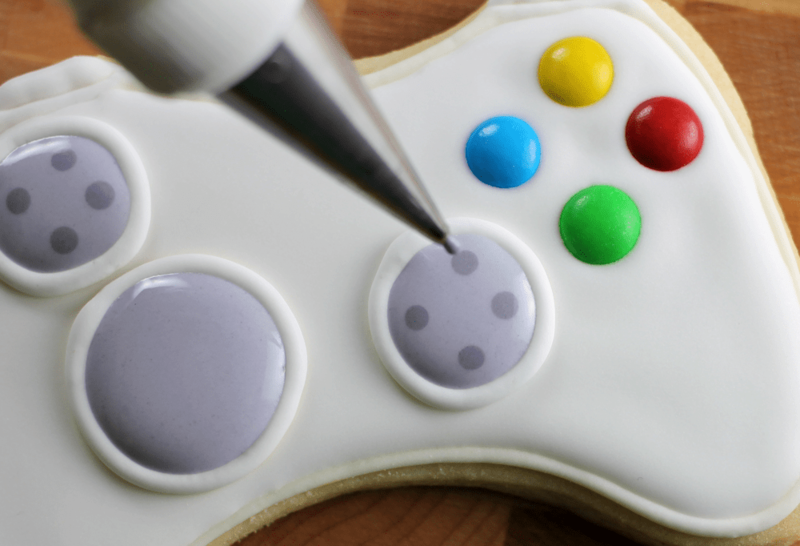 Oh, if only decorating a cookie were as easy as coloring on paper. Anyway, with a super general idea of what the cookie ought to look like, it was time to get to work. Once all of the cookies were baked and cooled, I outlined them with white royal icing. 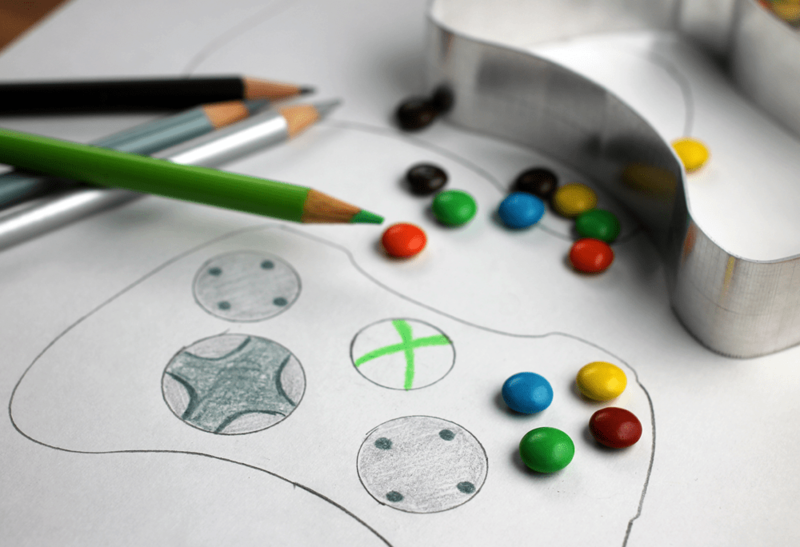 I had some mini M&M’s on hand and they happen to include the four colors needed for the controller buttons. PERFECT! 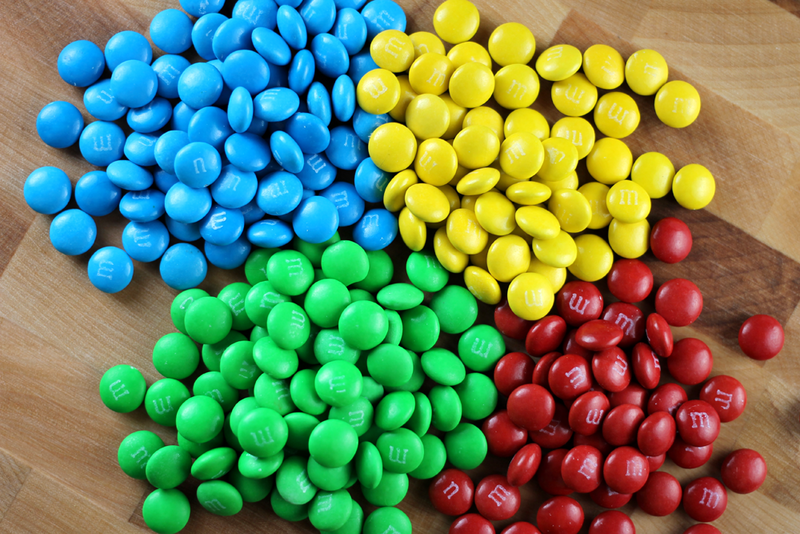 It only uses four of the six colors, so you get to eat all the brown and orange M&M’s you want. Or save them for your next Thanksgiving or Halloween project? After the royal icing outline has had a chance to dry, fill them with slightly thinned out white royal icing. 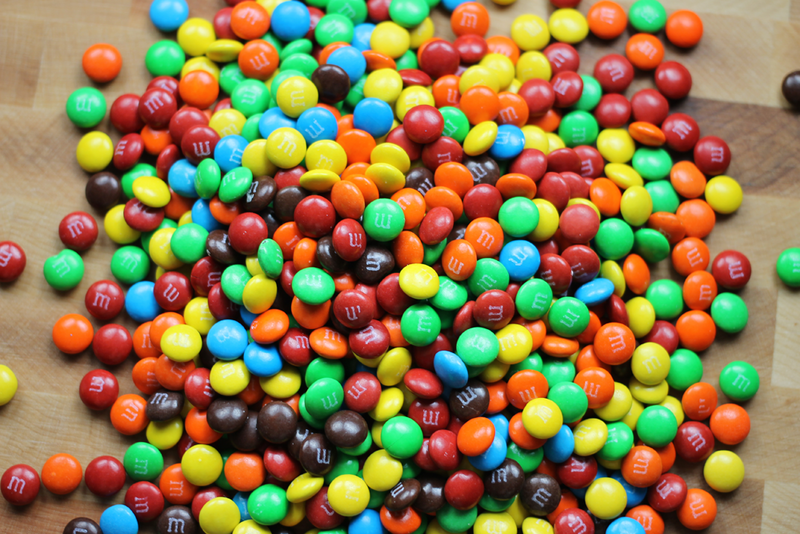 Once they’re filled, and while the icing is still wet, drop in the four M&M’s buttons. Just make sure the M side of the candy is face down. It’s not the end of the world if they’re not, but better if they are. 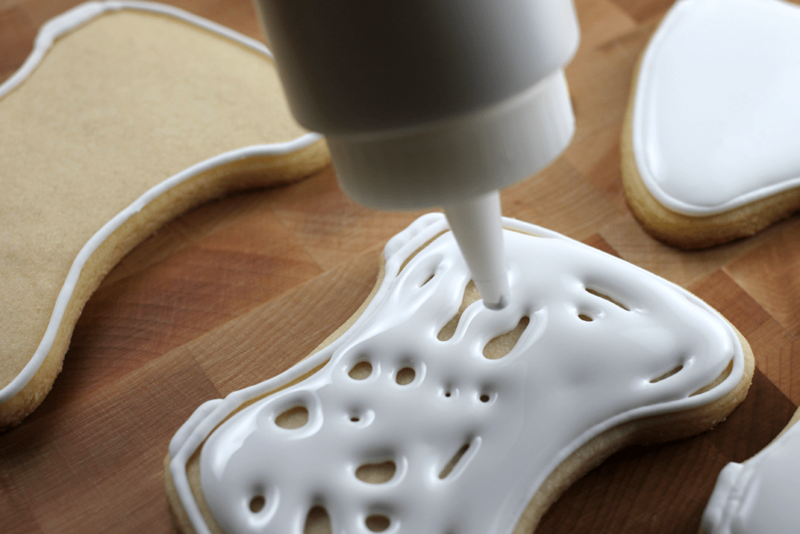 If you’re a royal icing whiz who can make the perfect little circles (firstly, I hate you… secondly…), you can get started on this next step much sooner. 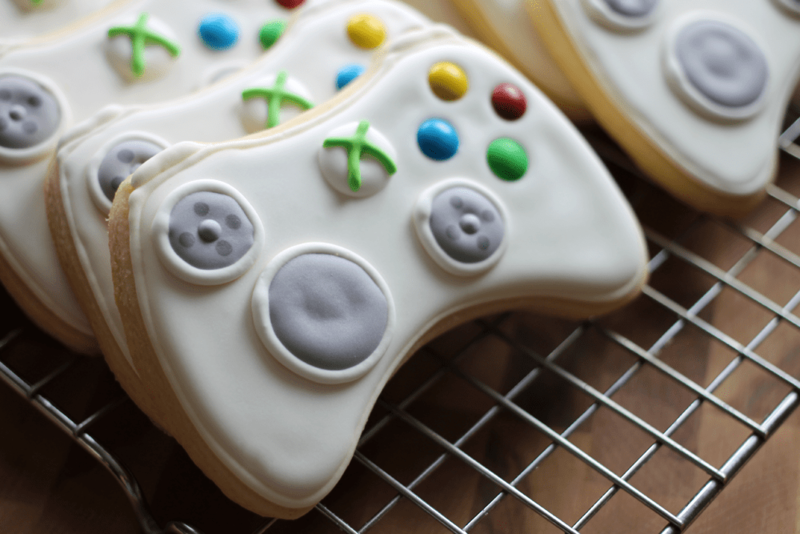 Since I’m no pro, I let the cookies dry overnight before making the buttons on the cookies. See, I need help. I thought I’d be able to freehand the circles for the buttons, but after a few very sad attempts on wax paper, I knew that I’d have to use a stencil. On completely dry cookies, I traced circles using a food coloring pen and two different sizes of piping tips. I went just around my guidelines with some white icing and let that dry for a bit, then went back with grey royal icing. 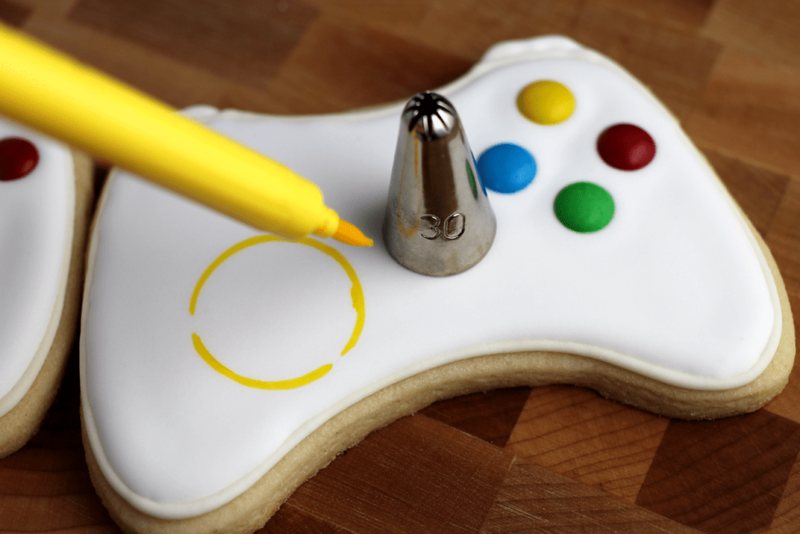 For the finishing touch, just add a white mound o’ royal icing on top and let it dry, then draw an X in electric green to represent the Xbox logo. 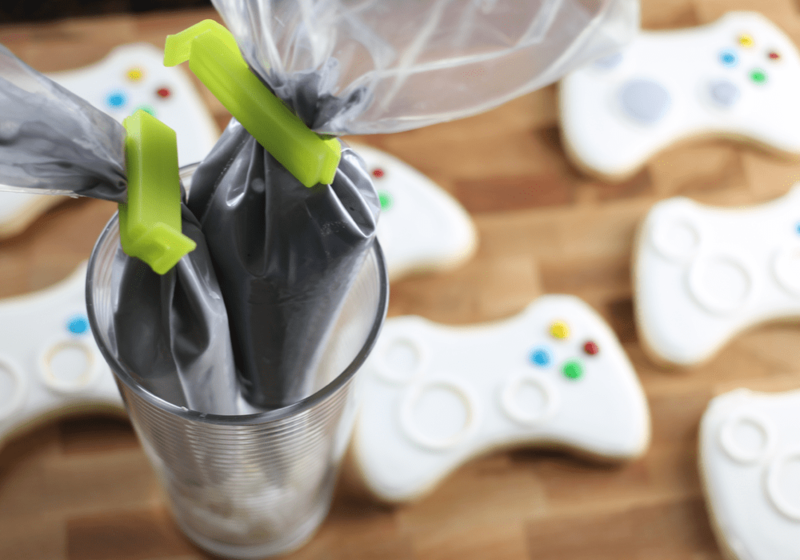 Once dried completely, I added a bag to each one and now they’re the perfect birthday party favor! Will you share where you found the cutter? 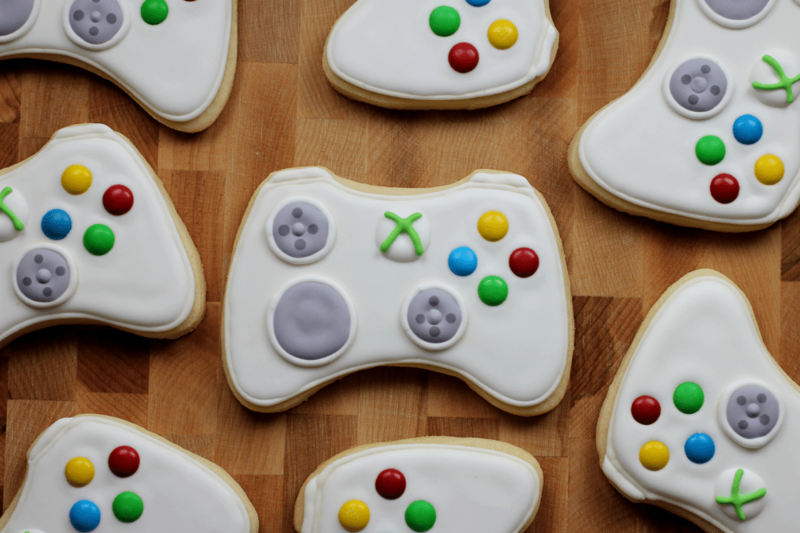 Can I buy a few dozen of these Xbox controller cookies? 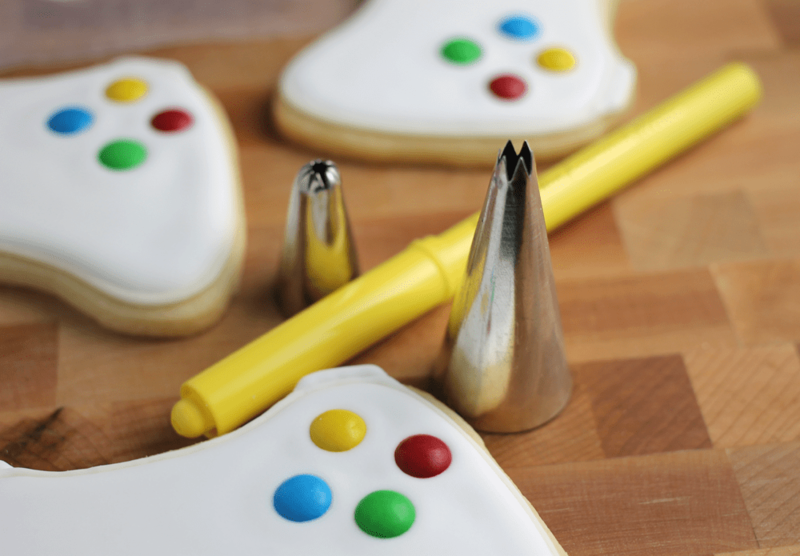 What royal icing recipe did you use and can I have it? And do you think this can be done with fondant also? The royal icing recipe I use is this: 4 Tbsp, 1 pound powdered sugar, 1/2 cup water. The ingredients are placed in a mixer and whipped for several minutes, until the desired consistency is achieved. And these could totally be decorated with fondant. 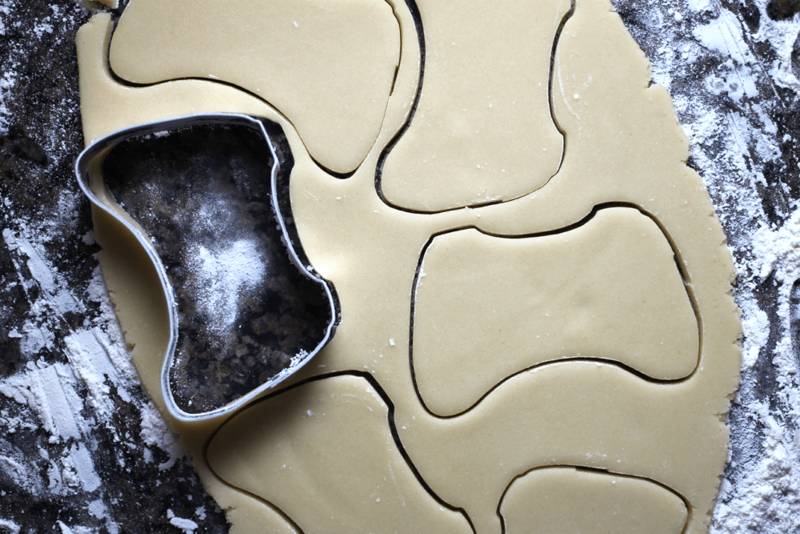 Fondant would eliminate the dry time that the royal icing requires between layers. 4 tablespoons of what? Making these asap!! Haha! I guess that might help! It should state 4 Tbsp of meringue powder. Hello! Do you taken orders? If so, how much for 25 cookies? My boys are turning 13 & 11 next month and are having a game truck party. Thanks! The cookie calendar has been especially busy these days, so I’m actually totally booked for March at this time, so I unfortunately won’t be able to fulfill another order for that time. Please let me know if you have any additional questions! I love these! Making them now and using the m&m’s on the royal icing. You didn’t have any trouble with the color from the m&m’s running into the white royal icing did you? If the white icing is super thin (watery), then there’s a chance the color could run. I would suggest keeping the white icing as thick as possible for flooding. I also often use an oscillating fan on my cookies these days to help them dry faster. I would help prevent any possible color bleeding as well. Good luck! 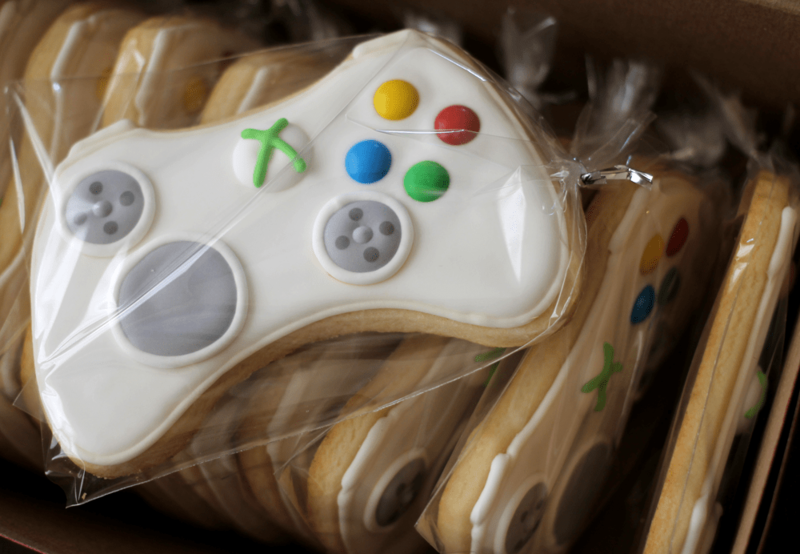 Hi Angelica- Is it possible for me to place an order with you for 12 of the Xbox Sugar Cookies?